There are oodles of methods to choose from when making the attempt to dodge a “honey do” list or any to do list for that matter but what better way to do so than hiding out in a cabin, built by a man, simply referred to as “Hughes” as local legend has it, in an attempt to avoid conscription into the Confederate Army? Furthermore, his alleged success in avoiding military service during the Civil War should be a testament to just how off the beaten path we are talking about.1 After making the trek myself on foot, up a gated, four-wheel drive, U.S. Forest Service jeep trail that also serves as the only wide and well trodden path to the cabin, I quickly arrived at the conclusion that no one of sound mind would choose this location with convenience to town in mind. With the path’s increasing grade, switchbacks, and water crossings beginning at the North River foot-bridge, followed by crossings at Big Cove and Donley branches, I wholly understand why someone would choose the location for a hideaway. 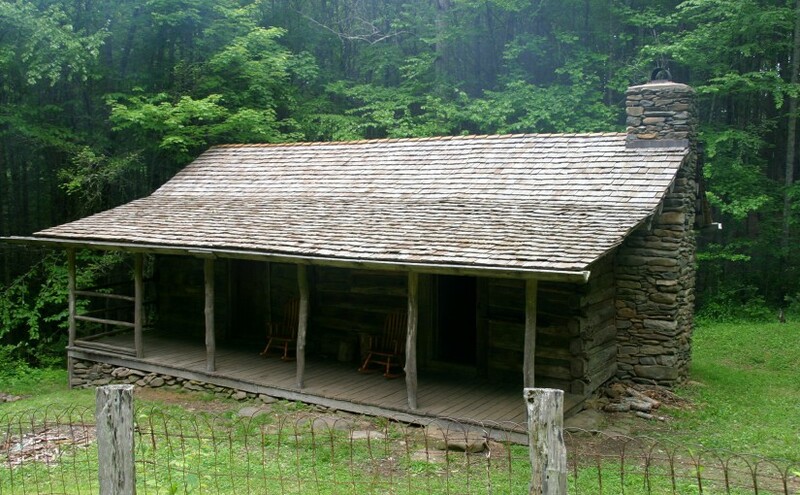 With three water crossings, a moderate trail grade, and an almost guaranteed chance at meeting up with a local copperhead or rattlesnake during the warmer months, it is understandable why the cabin was constructed where it stands today and has so for well over a century in the historic Tellico Ranger District of the Cherokee National Forest (CNF). 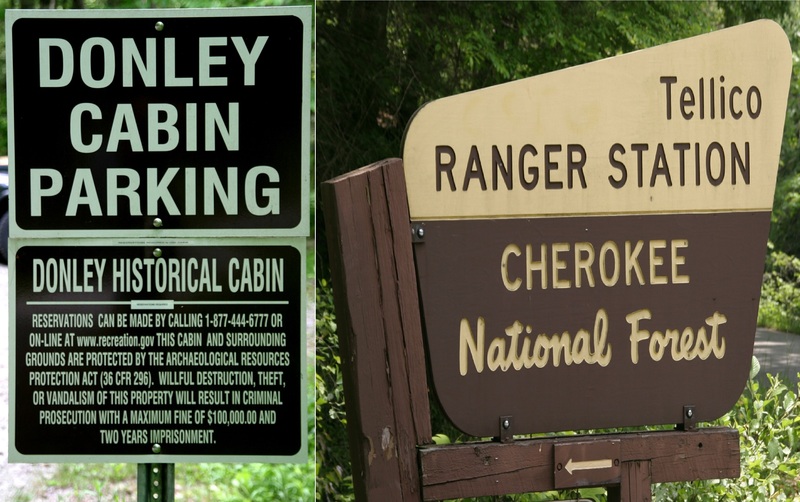 Donley Cabin Parking area sign & the Tellico Ranger Station entrance sign. 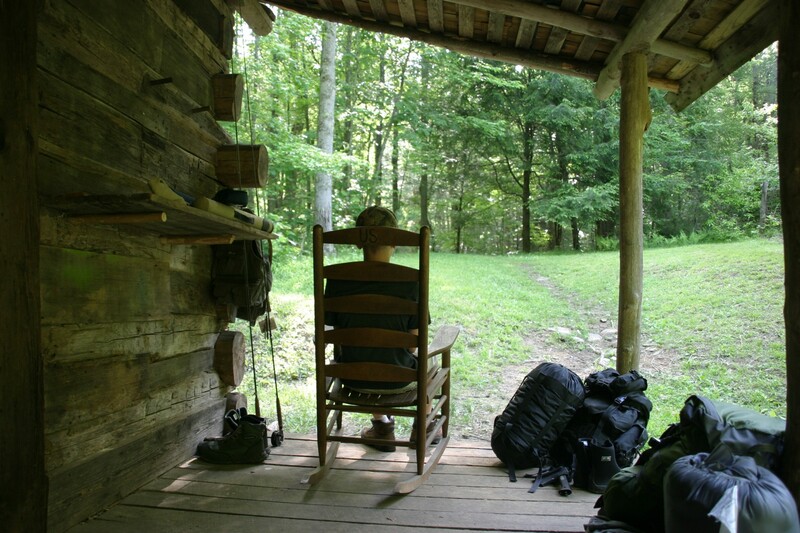 The Tellico Ranger Station building is historic in itself and worth a visit. The staff is always courteous, pleasant and very helpful if you have questions. I’ve read at least three different accounts regarding the individual or individuals as some proclaim, responsible for building the original and subsequent additions to the cabin with at least that many versions regarding the identity of those that used it to avoid being swept up into the ranks of the Confederate Army. After consuming a mishmash (did I say consuming mash? Nevermind, forget I said mash), of recorded fact and verbal local legend, I don’t think we may ever know the whole truth. But no matter, the Donley cabin is a safe place for the trout bum to weave their own tale. What makes the Donley Cabin so appealing to the trout bum at heart is the location. You know the old saying-location-location-location. 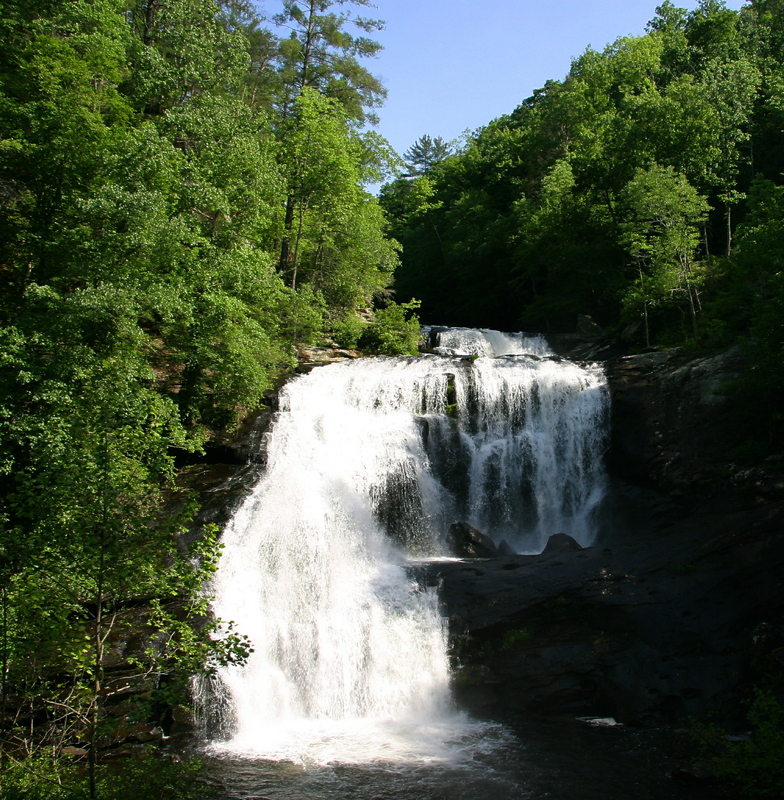 The cabin is sandwiched between two impeccable rivers, the Tellico River and one of its many tributaries-the North River. But wait-there’s more; just like the wild local muscadine grapes that grow in the region-the Donley cabin gets even sweeter. 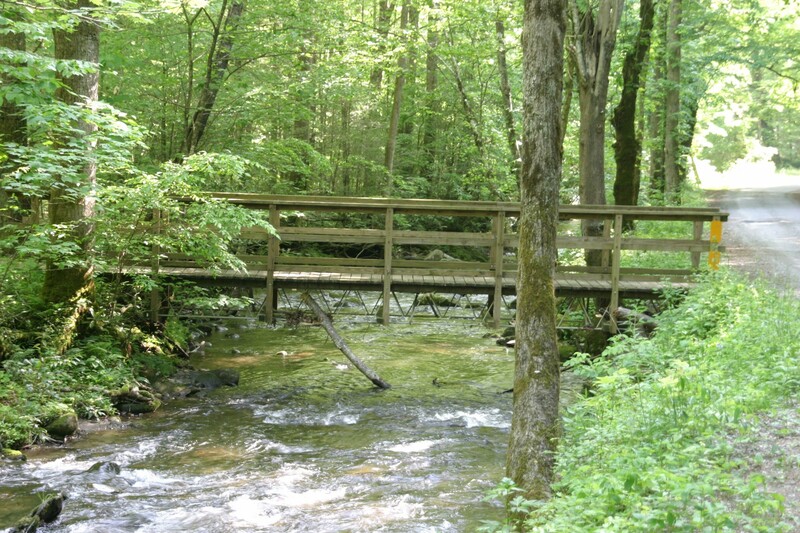 With the cabin within walking distance of other superb tributaries of the Tellico ,such as Sycamore and McNabb creeks, and a short drive to the gorge hammering Bald River, all of which incidentally hold brook trout at higher elevations, your only quandary will be deciding where you want to fish- first. I’ve always found it virtually impossible to pass up fishing the North River even though other alluring water is available close by. I dare you to try and stroll from the cabin along the path leading back to North River Road and make an attempt at not getting your line wet-at least once-at the North River foot-bridge crossing. I’m not much of a betting man but I’d wager you a steak, beer, and bread that you wouldn’t even make it back over the foot-bridge before breaking into a cold sweat and succumbing to the urge to cast-just once. Currently, the cabin is open for reservations year-round with the spring, fall and holiday seasons typically being the only periods that you might have to plan ahead to secure a reservation which is in itself-remarkable-from the standpoint that this cabin is rustic and I do mean-RUSTIC. Have no illusions; you won’t find any electricity, running water, air-conditioning or indoor toilets. As such, the Donley cabin holds its own place between tent camping and more modern RV campsites. It not only serves as a great trout bum outpost but as a valuable reminder to us all of the modern amenities that we sometimes take for granted. Case in point, after a two night stay at the Donley cabin in late spring, my oldest son of eleven, found a new understanding and respect for the pioneers that carved a life out of the surrounding forest and waterways. I thought he summed it up well by saying, “Dad, they [settlers] were a lot tougher than I am but the fishing sure was good, so I’d go back anytime.” He was right about one thing, the fishing was excellent but I’d go back only with a pack mule for hauling supplies. Well, a red flyer wagon would do, I suppose. On tertiary thought, maybe an ox would be even better. Yes-I know. You are thinking, these guys must pack like women. Yes-I know. Some of you may now have your fine-hackle ruffled over that comment. Mind you, I didn’t call anyone an old hen-yet. How do I salvage my integrity now? Oh, yes! I must quickly point out other’s flaws-BUT my wife has a closet full of shoes even Imelda Marcos would envy! Well-not really that big of a collection-but I tease her about it often just for sport. I must admit, she is a practical traveler especially when it comes down to a fishing trip; other than her hiking boots and wading boots or sandals, seasonally dependent of course, the rest of her collection stays at home. Yes-I know. You think I’m a charlatan because my wife fishes with me sometimes. But what better way to keep her in the fold of the trout bum support system? See, I’ve taught you something already. So-where were we? Ah-YES, I was recollecting that even with sore muscles and exhaustion as a result of my self-inflicted hardship, I found a proud moment as a parent because my oldest son became a young man on that trip. Not once did he grumble about pack muling the supplies and equipment to and from the cabin, being wet and cold or to hot, nor was he afraid of the wildlife [bears] or the dark. He still hasn’t stopped talking about that trip. He even thought the mice that squeaked and tumbled about at night as they frolicked in complete darkness were a jovial delight. I couldn’t help but think where there are rodents there are almost certainly-venomous snakes hunting them in the darkness. Ironically, late the very next morning as we rolled back into camp for lunch, I passed right by a copperhead-twice. It was perfectly nestled into a depression full of fallen leaves in one of the cabin’s wide rock steps. My son pointed it out before I made the third and possibly final pass after I’d altered my course to and from the cabin. What can I say, I was lucky. I almost stepped down onto this rock step after I altered my course coming out of the cabin from the other door. 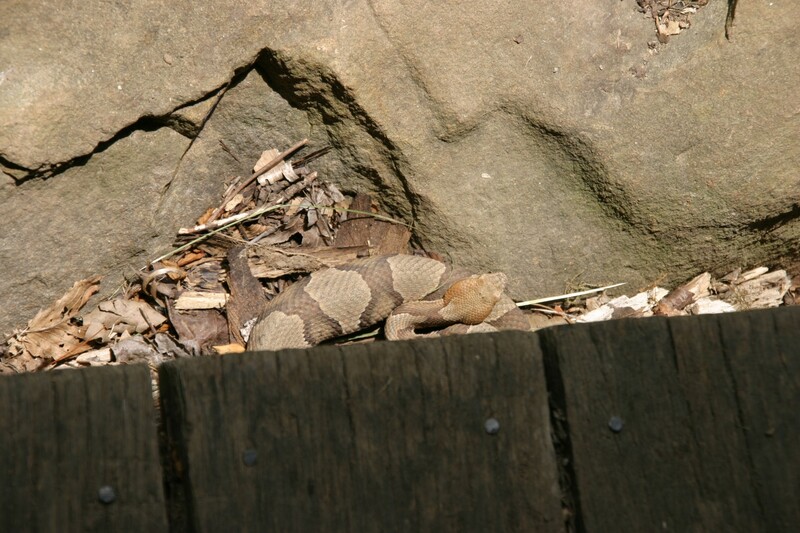 My son spotted this copperhead before I did. 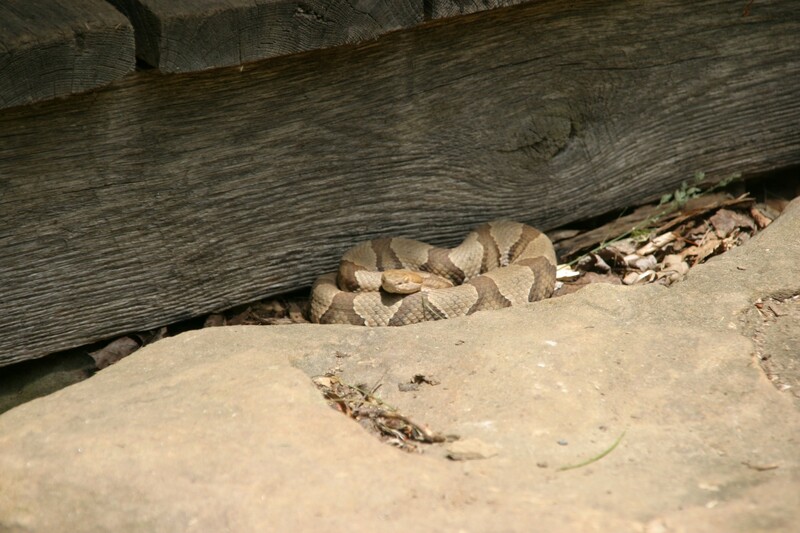 Donley Cabin copperhead ready and waiting on one of the rock steps. The one I was about to step on after I’d passed by on an adjacent step-TWICE! Yes-I know. You are thinking, “When is this guy going to start talking about fishing?” How about now? As we began to fish the first morning, the overcast gave way early and sunlight began to dance on parts of the North River through the tangles of laurel and rhododendron that lay beneath the pines and deciduous hardwoods as the sun rose from behind McIntyre Lead (ridge) and Round Mountain. After a brutal winter by Southern standards with the water temperature finally breaking into the 50 degree range, 54 degrees to be exact on this particular May morning, I was just a bit surprised the trout were halfheartedly taking, then summarily spitting out dry flies or avoiding them all together. Bead-head prince nymphs were being hammered with reckless abandon when fished at depth in currents swift enough to show the promise of sucking your line under a boulder for eternity. If the run was fast, from beginning to end, with deep shelter as the water was split or shifted by a boulder before spilling into the adjacent pool downstream-you just couldn’t go wrong. Another indication, I was doing it right was the overwhelming feeling of dread in my stomach telling me my nymph or leader was going to get hopelessly snagged in a rock crevice at the end of the drift. Swift-water with no current seams would be yet another way to characterize the type of water I’m talking about. The trick was to get the line deep-very quickly; standing perpendicular and about midway in relation to the run, casting into the very head of the pool to allow ample time for the fly to sink and a chance to mend . Nymphing the North River just down from the Donley Cabin foot-bridge. For this particular technique, I use sinking line. Yeah-I know, sinking line instead of a dropper rig or a new fangled float-a my-bob-thingy with split shot? But a dropper is the only way to go-right? Consider this for a moment. The scientific part of me gave the floating line with a dropper rig and float-a-my-bob-thingy with a hefty bead-head prince nymph as the terminal fly on both rigs their chance prior to using the sinking line and bead-head prince nymph-without even so much as a rejection. When immediately fishing back over those very spots using a sinking line and a weighted prince nymph-the results spoke for themselves. My hypothesis; the fly simply wasn’t making it to the bottom fast enough when suspended by any means (dropper or thingy) even with ample leader length-the fly floated well above and out of sight of the feeding fish. Just in case you’re wondering, the floating lines were neon yellow and I’ve seen fish refuse a fly because they see the line. We all have. Or should I say, anyone that has fly-fished enough has cast fly-line over a trout only to see it dart or go into a holding mode on subsequent casts and refuse any other offerings. So, I don’t think fly-line color was a factor because I caught fish over the same holding areas afterwards using the sinking line. In the end, only the sinking line was able to get the job done that particular morning for us. Rainbow on a prince nymph variant (yellow flash dubbing). They liked the Ostrich Prince nymphs even better. My other hat-trick that morning was to simply to find the water that balanced entanglement risk with pragmatic expectations. 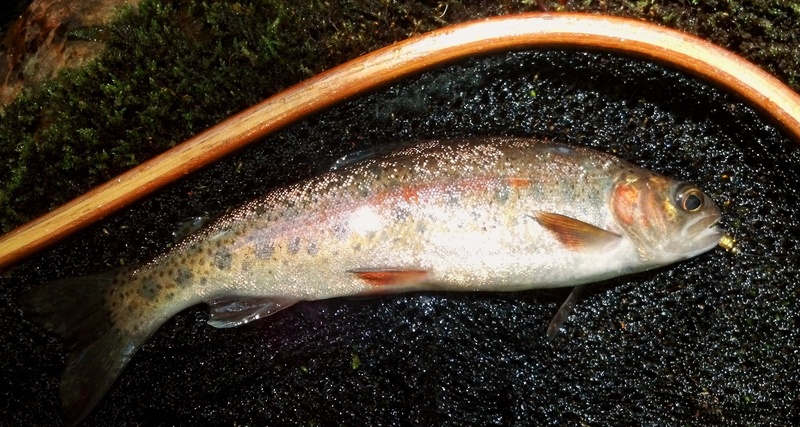 You must skip over some otherwise fishable water because of submerged logs or complex cross currents where a dropper would normally produce, but due to how deep you must fish the fly and how delayed the line reclamation has to be with this method the most difficult part is overcoming the urge to take the high risk of entanglement on familiar waters. Yes-I know. 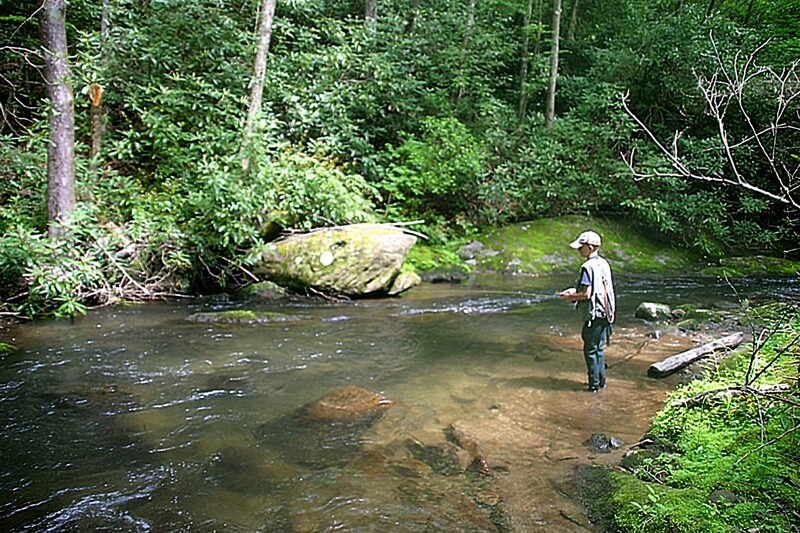 You are asking, “So how am I supposed to know where the submerged logs are located?” Answer-there is no other way but visiting the stream or even better fishing it in low water to really know. There is always that chance that a log will sneak into the stream at any time afterwards. Every cast when nymphing with no flotation is an elevated risk that you will just have to take. Make sure you take all of the nymphs you tied over the winter with you. If you don’t lose at least one [nymph] using this method-you are doing something wrong. Wild rainbow trout from the North River. We kept these two for dinner. 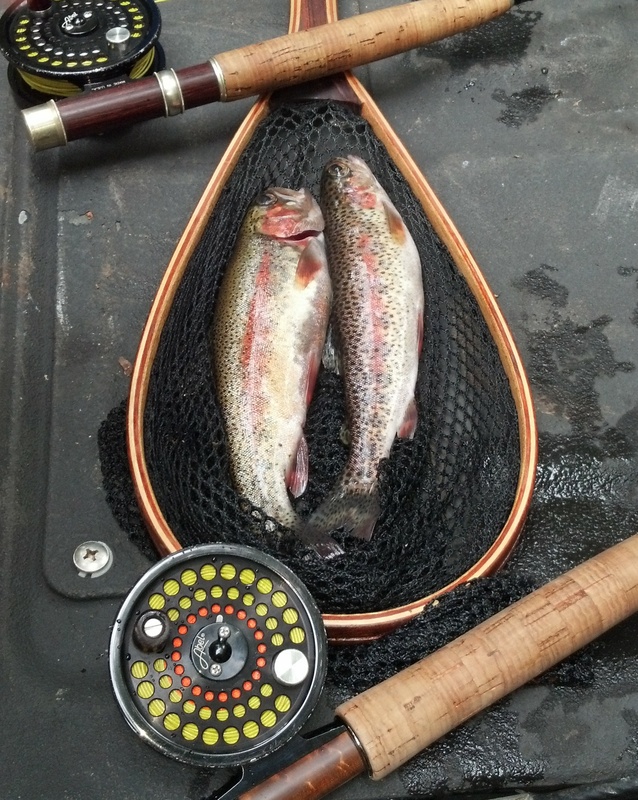 After catching several rainbows on prince nymphs, we adjourned for lunch at the Donley cabin, returning to the North River later that afternoon to the beginnings of great dry-fly action. Orange and yellow stimulator, yellow sally, and yellow elk-wing caddis patterns were all the rage. It was such a delight to see the trout bashing the dry flies as hard on the surface as they did the nymphs earlier. Twas not until our stomachs started to rumble that we reluctantly headed back to the cabin arriving just before sunset. It felt like returning home which compels me to diverge for just a moment and mention what I’m about to say. It tugged on my heartstrings more than a bit when I read an account that reported Jack Donley requested in his final days to, “be carried back across the river,” to his cabin.3 I don’t know if his request was granted but I’m not surprised that he asked, as there are few places I’ve found so close to my own home as peaceful as the cabin that bears his surname. Like much of the history regarding the Donley cabin, I don’t know if we will ever know exactly what he said and the subsequent events that transpired in his final days but for this particular part of the story, I choose to believe his request fell upon the ears of someone that could grant what might have been his final wish. One of the Donley Cabin’s rocking chairs stamped U.S.
Coming full circle, I was thankful that the fishing was everything I’d hoped it would be and more after working so hard to just sleep near the fish. As I mentioned earlier, the hardship could have been avoided. I’d passed by the path leading up to the cabin numerous times over the years and I‘d never bothered to scout it out. You know the surrounding water was calling me. What can I say? Then there were those things that are unavoidably avoidable, like my wife not leaving work as scheduled so she could be at home with my two youngest, pushing our arrival the first night to much later than anticipated. Such is the life of a medical professional. Excuses, excuses, I’m full of them, too. 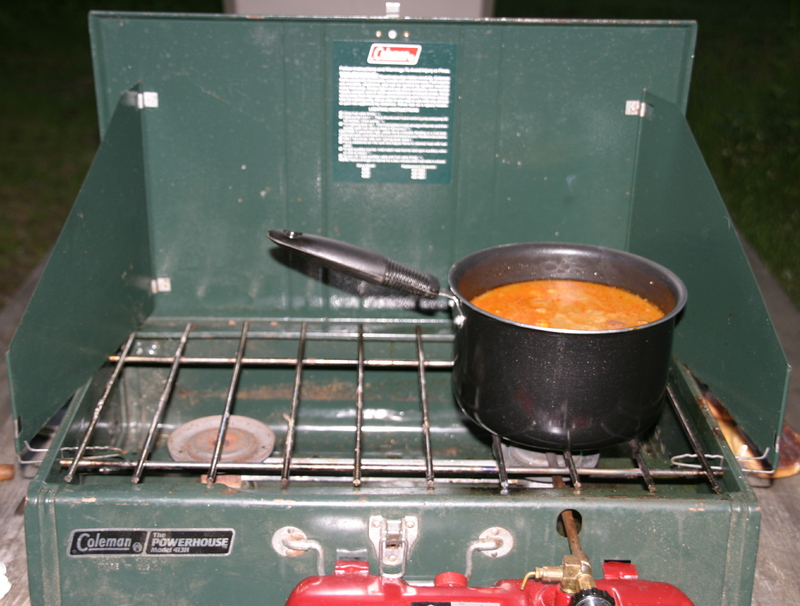 Home-made steak soup heating up the first night in camp. We freeze it to keep the cooler colder longer and so it cuts down on prep time. Good Stuff!!! In my defense, we didn’t expect packing in our supplies to be much of an issue based on what was stated about the trail complexity on the reservations page. However, by the time we’d packed in all of our supplies and equipment from the parking area to the cabin [in seven roundtrips] and re-heated our homemade steak soup on the vintage but trusty Coleman stove, we were well past legal fishing hours-half hour before legal sunrise to a half hour after legal sunset-so we sat around the campfire, rigged our rods, checked our fishing equipment, or gadgets as my wife affectionately calls them, and planned which direction that we’d be heading the next morning. So what appeared at first to be a failure was a really a blessing in disguise, as I’ve found times like those in camp to be as rewarding as being on the water. Being able to talk with anyone, especially my children, with no interruptions from the outside world is no doubt a treat with everyone plugged into the grid these days. Which brings up this important tidbit of information, I’ve never been able to receive any level of cellular phone service while staying at the Donley cabin or within the vast majority of the CNF. Plan accordingly because help, especially advanced medical care, is HOURS away-especially at night. Make contingency plans for emergencies with the thought in mind that your smart phone, even as smart as it is supposed to be, most likely will not be able to summons help. As always, let someone reliable know your plans. Yes-I know. That means you have to tell your spouse, boss, family or friends where you are and when you will return. But that’s okay because remember-you’re an undercover trout bum [UTB] so you have to at least give the impression that you are still somewhat plugged into their grid. You can’t win them all-just like you can catch them all-can you? Wow, what a great post!! Thanks for going to the trouble of taking us along. Wonderful photos and stories. I can just smell the inside of that old cabin. I thought I had done something rustic when I stayed at the Wonderland Hotel, but you for sure have me beat with this one. I appreciate the kind words and I’m pleased that I could take you along for the ride. If I’m not mistaken, the Wonderland Hotel is not with us anymore. I think it had to be demolished recently due to its condition. It would have been a great trout bum safe-house, too! Jordan Liles walked around the abandoned Wonderland Hotel and made this video. https://www.youtube.com/watch?v=zfaTpunhJRs Someone put it on facebook and I saw it and was shocked! I went there in 1983 and made a pencil drawing from the front porch because there was NOTHING else to do. I don’t see a way to attach it. I ate supper in the little restaurant there with all the red and white checked tables. It was a lovely place and I can’t believe it’s gone. I’m so glad the cabin you showed us has been preserved.